2004 was supposed to be about testing all the systems, using them to make sure we understood both how to use them and how to maintain them while were still in the marina near the professional installers before we cut the dock lines and left that safety net. But at the last minute ... literally a month before our leave date of October 2004, we decided to add a new electric windlass. Winterlude had a very good manual windlass, but after hearing horror stories from cruising friends about cruisers who should have reset anchors, but didn't because picking up 100 feet of chain and an anchor against a 20 knot wind was just too hard, we added the Lighthouse 1501 electric windlass. And we are SO glad we did. It was one of the best additions we made! We've owned Winterlude now for almost 2 years. We've spent a small fortune and used the two years to outfit the boat for cruising. When we bought Winterlude, she was primarily a daysailor with some electronics because the prior owner enjoyed them. But she was not outfitted for any extended cruising. This is a log of what we've added & our thoughts on the process. Keep in mind, alot of this stuff is nice, but not necessary! GO! You'll never regret it! Newest stuff is first, listed chronologically back. November 2003 .... Lots of work happening on Winterlude! 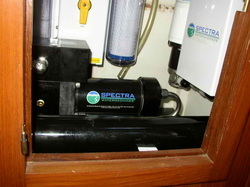 The Spectra Watermaker was installed under the galley sink by Tropica Marine. We'll learn to use it when we spend some time on Winterlude in January 2004. I'll have to find more places to put pots & pans & cleaning stuff, but it's well worth it to know we have fresh water! We just ordered all the paper charts for the Yucatan, Belize, Rio Dulce & Honduras; plus we already have Nigel Calder's Cruising Guide to the NW Caribbean, Freya Rauscher's Cruising Guide to Belize and Mexico's Caribbean Coast including Guatemala's Rio Dulce and the Rain's Mexico Boating Guide. The latest news is that Jan is learning Spanish (actually David's learning a little too just by being around) -- the goal is that by the time we need some Spanish, we'll be able to carry on a little bit of conversation beyond "Me llamo Juana y hablo un poco espanol!" 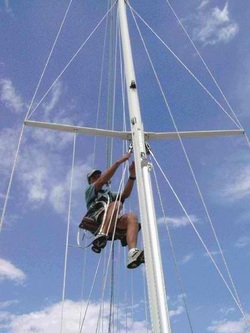 Rick from the Rigging & Canvas Co., Port Charlotte, FL, let us "help" replace the standing rigging! It was 18 years old, but in good shape. Before we leave for our cruise, tho' we wanted to be sure the chainplates were in good shape & the standing rigging was new. We learned a TON about rigging & even learned to assemble a Sta-Lok, which we used for the new stays. The Harken roller furling is in good shape & Rick serviced it, showed us how to take care of it & we put it back up -- on a new forestay! Rick also is adding a spare halyard, installing folding aluminum mast steps to the first set of spreaders & at the top of the mast, replacing lifelines, added a Mobri radar reflector. and is adding a separate trysail track to the mast. Staying in the boat in August in SW Florida helped convince me that I wanted a small microwave. Adding this inverter has caused all kinds of "problems" -- all for the pleasure of using my Mr. Coffee in the morning, not adding heat to the cabin. Altho' we use the charcoal grill at anchor, the microwave will be handy for heating up leftovers & popping popcorn, one of my favorite snacks! A/C!!!! Finally! We broke down & had an A/C system jury rigged for Winterlude. Staying in South Florida all summer is hard on a boat and the people working on it -- we have a dehumidifier, but it's HOT. So for $83, we bought a room a/c unit from Home Depot & jury rigged a hood to make it work over the main hatch in the salon! Heaven!!! Just because I haven't updated this page for awhile doesn't mean we've quit preparing Winterlude for our upcoming cruise! 1. ICOM 502M VHF Radio installed down below at the nav desk and a remote CommandMic added to the cockpit. One of my big frustrations with our current VHF setup was that the handheld never seemed to pick up transmissions when coming into a marina & I'd have to run below, try to hear the dockmaster over the roar of the trusty Kubota Nanni diesel & then SCREAM the instructions back up to David at the wheel (who couldn't hear them anyway & I'd have to go back up & then run back down -- just not good. Now the new setup has a station at the nav desk & in the cockpit. 2. Late August 2003, Winterlude went to Gasparilla Marine to get new bottom paint (we're going with Micron CSC again because it's been over 2 years since we had the last coats put on in Annapolis & it seems to be working well), raise the waterline a couple inches (equipping this boat for cruising is HEAVY!!! ), replace the cutlass bearing, check & lube the seacocks, repack the stuffing box, install a dynaplate for a better ground for the ICOM M802 Ham Radio. We added a Solar Module from Hotwire. This is cool -- two Sieman's 55 v solar panels are hinged together. They fold outboard & rotate with the sun. We figure we use about 150 amps/day, so we may need to add another set of these panels, but we're starting with 2 and we'll monitor how many amps/day we get from them. 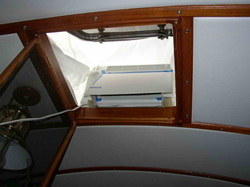 This installation also uses a new Solar Boost controller specially designed for the RV market & sold by Hotwire. It uses MPPT (Maximum Power Point Tracking) and is supposed to exact additional power from the solar panels under certain conditions. We'll see! 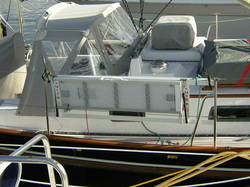 November 2003 - the 2nd SMSB has been installed on the port side of the boat. Now we have 220 watts of solar.November 2003 -- we're also adding a KISS Wind Generator on the back of the boat to provide power for the Spectra Watermaker. Ham/SSB Radio. 2/2003. We ordered an ICOM M802 ham/ssb radio & complete package to allow us to connect to e-mail & weatherfax via a PactorIIPro modem upgraded to PactorIII. This will give us e-mail access via WinLink 2000 from anywhere in the world, plus allow access to weather information & various geographic "nets" for local knowledge. Photo show the control head - we'll install it above the stereo where the plaque is now. We're hoping to have the entire package installed by mid-March 2003. I can see why some boats never go cruising! The more you accomplish on your To Do List, the more you realize can be done. At some point, you just have to quit adding "stuff" and GO! But since we're not quite ready to "go", since Billy has another year of school & the stock market just isn't cooperating, here's our current "Wish List" of additional boat projects. ICOM M502 VHF with a remote command mike at the binnacle. Done 8/2003. Garhauer Kayak Racks: Being built 11/2003. Storm Sails. We're still trying to determine the best configuration for our sloop rig. We already know we want a separate track on the mast for the Trysail. Spare Autopilot. We have an Autohelm ST4000 autopilot PLUS a Monitor Windvane. Since the ST4000 doesn't have the best reputation for reliability, we want a spare. BTW, our ST4000 worked fine on our way from Annapolis to Florida. Monitor Emergency Rudder Conversion Kit. No explanation necessary! Millions of small details, from figuring out how to restrain the gimballed stove & non-latching floorboards, ongoing maintenance, jerry jugs, replacing the cockpit speakers, finding the correct wrenches to fit everything on the boat, supplementing the growing cache of spare parts, getting a stainless folding cart, considering a para-anchor, charts & cruising guides for where-ever we wander, so on & so forth, the list NEVER ends. Such is life on a cruising sailboat! Whale Manual Water Handpump for Head. I HATE our pressure water system, it works fine, but I just don't like it. 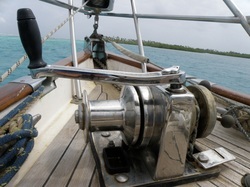 We have manual footpumps for salt & fresh water in the galley, but none in the head. This means we have to turn on pressure water to brush our teeth -- or use the galley sink -- YUCK! So we're putting a manual handpump in the head. Kayaks. I wanted kayaks, even tho' our deck space is limited. Why go to the gorgeous islands that hopefully we'll travel to in the next several years if I can't explore them by kayak. We tested all kinds and ended up with two Wilderness Systems Riots. The Riot is a 9', sit on top kayak. So far we love them, except for having to lash them on deck for passagemaking. But everything's a tradeoff & kayaking in the Dry Tortugas was a delight! Fuel Polishing System. 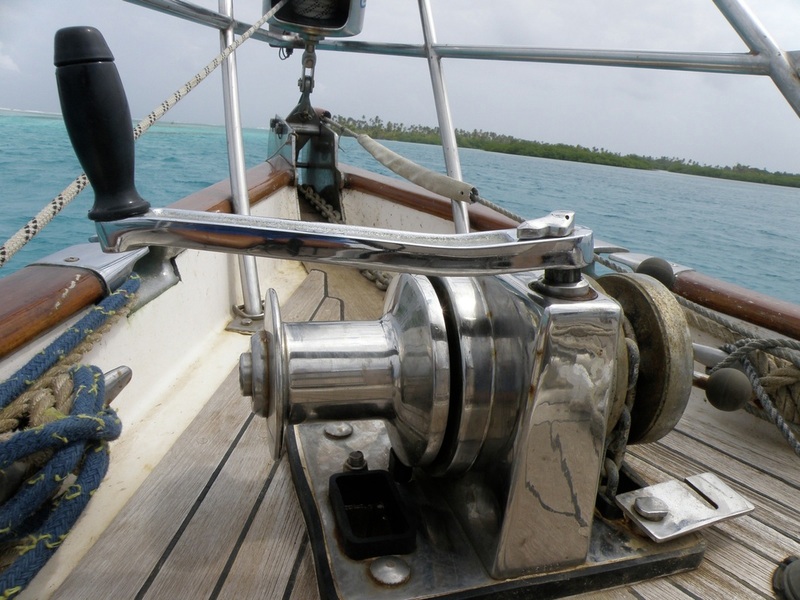 Every cruising boat in the tropics has trouble with keeping the fuel clean. Especially if you don't use the diesel alot. 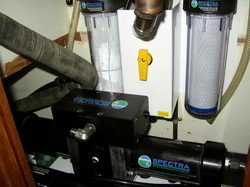 So we added an extra oversized Racor filter & an electric fuel pump so we can filter the fuel between use. This keeps the "grungies" to a minimum. Algae-X. There's alot of debate on the Algae-X and whether it's witch doctor wishfulness, or actually useful. But it seems to be working, so we'll reserve judgement for now. MaxProp. We had our MaxProp off for almost a year because it was creating a vibration in the engine. But now everything's fixed & the MaxProp was put back on in September 2002. We think we like it, altho' Diesel Don, our mechanic, thinks we'll regret putting it back on. For now, the boat has better control while backing & we think it may have a little more uuummmphhh in forward. Sailing is still up in the air because we really haven't had enough wind to see if we have less drag. Mounting Bracket for Liferaft. We had a custom mounting bracket for our Avon 4 person Offshore Liferaft, plus canvas to cover it & deter UV deterioration. It's nice having it out on deck rather than in the quarterberth, aka garage. Shelves for Hanging Locker. We converted one of the two large hanging lockers to shelves. It's amazing how much more "stuff" we can put on shelves than hanging! Shadetree Awnings. We needed a shade awning & this one is GREAT! We can walk under all the way to the bow! Hi Output Alternator. 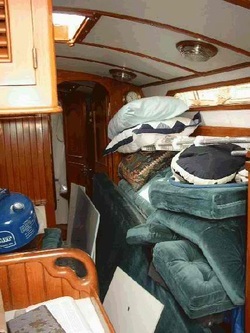 Welcome to one of the biggest hassles of outfitting the boat! Our 55 amp alternator wasn't big enough to charge our new GelCells in any reasonable amount of time, BUT we couldn't find a high output alternator that would fit in the extremely limited space. We finally opted for a Delco 110 amp alternator which seems to be working great! Now to get a spare since we had to have a custom fabricated bracket! Canvas. We added a cover for the liferaft, all the hatches, the outboard & miscellaneous stuff to retard the UV effects of the hot Florida sun as much as possible. Handcraft Mattress Company. We replaced the old foam mattresses in the pullman & quarterberth with "real" mattresses -- what a difference! We also had custom sheets & a comforter done for the pullman berth. The sheets stay on the bed SO much better now! Running Rigging. Replaced the main & jib halyard, had the rigging inspected and tuned by a specialist. Inverter. OK, so I admit I'm spoiled. I don't mind not having A/C, but not having my Mr. Coffee is beyond what I'm willing to live with! :) So we're adding an inverter to run my $9.95 Mr Coffee at anchor! It should also come in handy for recharging tools and a zillion other uses, so I guess it's OK.
Hotwire Port Fan. This is a cool little fan manufactured by Hotwire (see link above). 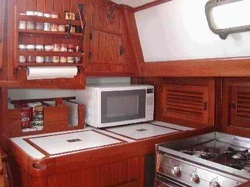 We're using ours primarily over the stove as an exhaust fan out the porthole, but it has lots of other applications. could NOT plane the Caribe period. Stephan at Defender told us that we weren't inflating the dinghy rigidly enough to allow it to plane -- the boat would bend in half, lifting the prop out of the water and "WHHHHIIIRRRRR"! We got a new Bravo 10 footpump and now the dinghy planes -- actually pretty scarey!!!! The Freezer. I guess we're lucky. Our Adler Barbour Super ColdPlate keeps everything cold. Unfortunately I don't appreciate this when the milk for my Raisin Bran is FROZEN SOLID in the morning! A friend suggested we get a piece of foam insulation & compartmentalize off the coldplate to keep the coldest air in a psuedo "freezer" section. We're trying it & so far are pleased! 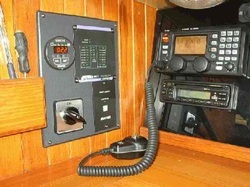 new 12V plug in Nav Station, rebuild winches, service seacocks, etc. Little Crane - so I can put the outboard on the dinghy & lift it to the rail. Convert Salon Table into raise/lower pedastal to make bed. Globalstar Satellite Phone - for communications on the trip from Annapolis to Florida -- worked great both for laptop communications giving us limited web access & e-mail as well as phone access in spots that the Verizon cell phone just wouldn't work. Isenglass Window - Cockpit Enclosure. We were glad of our new "Greenhouse" during our visit in January 2003 -- the weather was CHILLY, but as long as the sun was shining, we were toasty in the "Greenhouse".